Twitter has once again proved to be an amazing networking tool and I recently discovered Pink & Green Organic Skincare. This brand made a great first impression so I asked Carol (the founder) if she would like to introduce herself and products to my readers. Tell us a little bit about how Pink & Green Organic Skincare began? 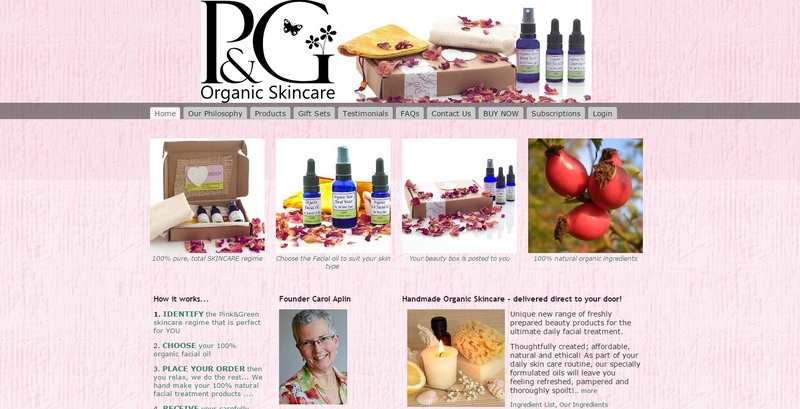 Pink & Green came into being in April 2014 when holistic therapist Carol Aplin, from Swindon in Wiltshire, UK, decided to create a range of natural, organic oil-based skin care products. Carol has been an holistic therapist for seven years when she identified that many of her clients were becoming increasingly stressed which had a physical effect on their skin. Some years earlier, she’d learned how to formulate skin care products when she completed a course on using natural ingredients for the skin and body. At that time she toyed with the idea of creating her own skin care brand but didn't take it any further at that stage. At the beginning of 2014, she started running workshops showing people how to enjoy the benefits of essential oils and carrier oils. She identified the fact that many people simply didn't know plants had benefits for the skin – something Carol had known and taken for granted throughout her life. Carol also realised people didn't know that oils can be used to clean your face and they didn't realise there are lots of chemicals and alcohols in facial cleansing which strips the skin and can actually lead to more skin problems. Natural oils cleanse the skin and provide balance. Last year, she came up with the idea of providing high quality, ethical, natural and organic skin care products by post. Overnight the idea for Pink&Green came into being. Pink was chosen to represent women, and green for the environment. Carol then conducted extensive market research including surveying women, creating focus groups and sending out samples for people to try the products and test the look and feel of the brand Pink&Green. It was officially launched in November 2014. We bombard our bodies with chemicals, not only inside but outside in our toiletries. Having grown up in the countryside I have a passion for the landscape and its beauty. What better way to combine the two. Respect for our planet and ourselves. Pink & Green offers customers a skincare subscription box, what made you decide to offer this unique service? Through my holistic work, I noticed a growing anxiety amongst my clients. They didn't seem to have quality time for themselves. Many were stressed, some had skin allergies or irritated skin. I thought that by providing a beautiful box of organic facial skincare products that arrived every six weeks through the post, would offer customers the opportunity to feel “hello gorgeous” every day. They also didn't have to rush to the stores to purchase new products as these would arrive as their previous skincare ritual ran out. My impatience!! I listen to my customers and what’s important to them. I translate these ideas into my own thoughts; then in to the products I create. It takes time. I guess I am childlike and get very excited about a new formulation. I have to be patient with the process of testing it; gaining feedback from focus groups; designing packaging etc. It is always worthwhile! What have been the highs and/or lows of establishing Pink & Green? It’s very exciting once you have your formulation; you've had it approved and registered – then you can bottle it and package it – the pretty bit of the journey. Also, my customers reactions to what I have made. Love it!! Lows – sometimes an idea takes a while to make it on to paper. Things whirl around for a long while at times before they become workable. Creativity is a journey that has many facets; it is so part of yourself and your own personality. What does the future hold for Pink & Green? Already Pink & Green Skincare is finding it’s way on to the shelves of health stores and organic farm shops, as well as customers purchasing the skincare ritual by post. It is my ambition to sell through Liberty’s, John Lewis and The National Trust. Do you have any skincare tips to share with readers? Treat your body to nutritious food, hydrate well and use natural skincare products. Avoid harsh chemicals by checking labels and asking questions of shopkeepers about their products’ ingredients. Feed your skin from the inside with healthy produce. Feed your skin from the outside with natural products. Your skin is the largest organ in your body and receives the liquid you drink last. So, to ensure your skin is in optimum health it needs feeding too, from the inside as well as the outside. Thanks for doing the interview - I'd never heard of Pink & Green until now! Following them on Twitter to keep up to date with all their products.